Observation - Rush - UK and Ireland. Description: Short (6-9cm) tough stems with pointed leaves and brown spiky flowers. Distinct long, white, hairs at joint of leaf to stem. 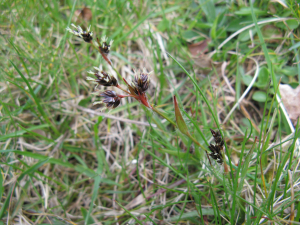 Short (6-9cm) tough stems with pointed leaves and brown spiky flowers. Distinct long, white, hairs at joint of leaf to stem.